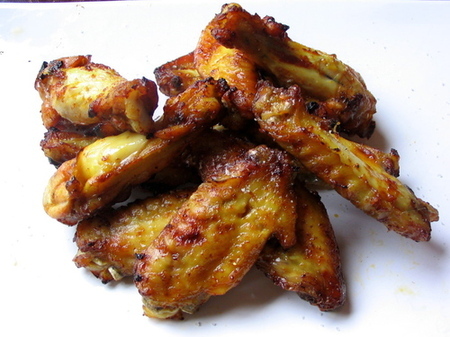 This is a simple spicy bbq chicken wings recipe from my very own collection. It is fairly spicy so if your not that keen on hot food just tone down the ingredients a little (use less of the spicy stuff). I'm pretty sure that you are going to enjoy this recipe. Good luck and just don't burn the chicken! Mix together the Chilli powder, sugar, garlic, ketchup, vinegar, worcestershire sauce, 1 tsp of paprika. Basicaly all of the ingredients! Stir together well, it should make a very spicy looking sauce! When it is time to bbq your chicken wings you need to get the bbq or grill nice and hot. Discard the marinade or use it for something else (like a spicy curry or something). Cook them quickly over a high heat for about 5 minutes and them move them to a lesser heat for another ten minutes. This method of barbequing ensures that all of the flavor from the marinade is locked onto the chicken. After ten minutes or so, check one of the wings to see if it is cooked and then serve.